Begins with the Sunday of Zacchaeus and runs through Pentecost to the last Sunday of the Pentecostarion-Sunday of All Saints. 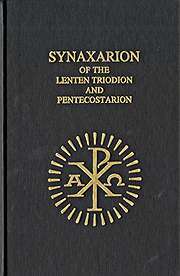 A synaxarion is a short account of the life of the saint or a commentary on the feast being celebrated. An abridged sermon of the Holy Fathers is included with each day, providing a wealth of information for homilies and study groups.